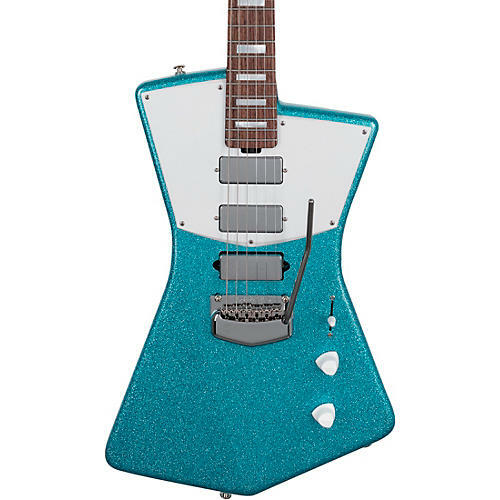 The St Vincent Ball Family Reserve edition guitar comes with an exclusive Turquoise Crush sparkle finish. The opaque sparkle African Mahogany features a 3 Humbucker pickup configuration and is fully buffed in polyester for a glossy striking appearance. A roasted figured maple neck with rosewood fingerboard is accented with pearlescent white block position markers, matching painted headstock and pearloid Schaller locking tuners. The overall aesthetic package is enhanced by a St Vincent autographed tremolo backplate and chrome hardware with white pickguard. Limited to 87 pieces worldwide. Includes hard case. One year parts and labor warranty on all guitars.